Did you know that today, more than 2.5 Exabytes (2.5 billion gigabytes) of data is generated every single day? And 90% of all the data in the world was produced within the last 2 years?According to a research conducted by McKinsey, Big Data will become a key basis of competition, underpinning new waves of productivity growth, innovation, and consumer surplus—as long as the right policies and enablers are in place. No wonder organizations nowadays are facing a shortage of Big Data professionals in the market. Considering the increasing demand of Big Data and Analytics professionals, we at APEX Global, bring you an incredibly strong foundation course that will help your employees understand the basic concepts of Big Data. If your organization is ready to boost its analytical capabilities or embrace big data strategies, this course can act as your Launchpad. With this course, we can help you build a strong foundation to let you explore large and complex datasets and communicate with data scientists by asking the right questions. We are market ready and internationally renowned for our course content, delivery and hand-on exercises. Get ready for an extraordinary data exploration journey with our bespoke Big Data career path! We understand that each learner has a distinct learning need. And, we cater to this need of IT Professionals in the Philippines and ASEAN region by making them dive deep into concepts of Big Data technologies, problems and systems. 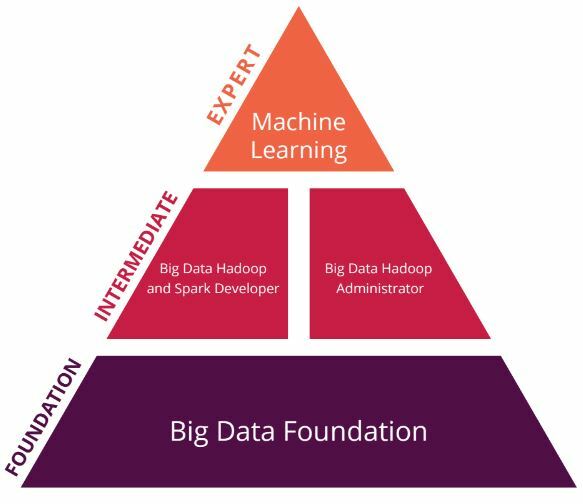 You can achieve the Foundation level by signing up for our Big Data Foundation course. Big Data Foundation is a two-day course aimed to make you learn the basic concepts and terminologies working behind Big Data. With a detailed explanation of grounding concepts, it will introduce and describe the most commonly used framework, Hadoop. Big Data Hadoop and Spark Developer is a four-day course that will let help you master the skills of handling the Hadoop and Spark ecosystem. With hand-on practice sessions, you will become an expert in dealing with various ecosystem components like Hadoop, MapReduce, Impala, Sqoop, Apache Spark, Pig, Hive, Yarn, Flume and HBase. Big Data Hadoop Administrator is a four-day course designed to provide detailed knowledge of the Hadoop framework, Hadoop cluste and HDFS. This course makes you proficient in concepts of core Hadoop distribution, cluster management solutions and Cloudera manager. Join the elite league by enrolling in our Machine Learning course. Machine Learning is a four-day course aimed to deliver expert knowledge of Machine Learning application and algorithms such as prediction, classification, clustering and regression. This course will also make you familiar with theories of Spark, Machine learning and deep learning. 1. Big Data: Why and Where? Explain the origin of Big Data which include three key sources: people, sensors and organizations. Exemplify real-world problems that establish the importance of Big Data. Discuss the impact and importance of 6 V’s of Big Data: Volume, Velocity, Veracity, Valence and Value. Describe the 5-step process of approaching data science problems. Explain the programming models and architectural components that are used to analyze Big Data. Install and run a program with the use of Hadoop.